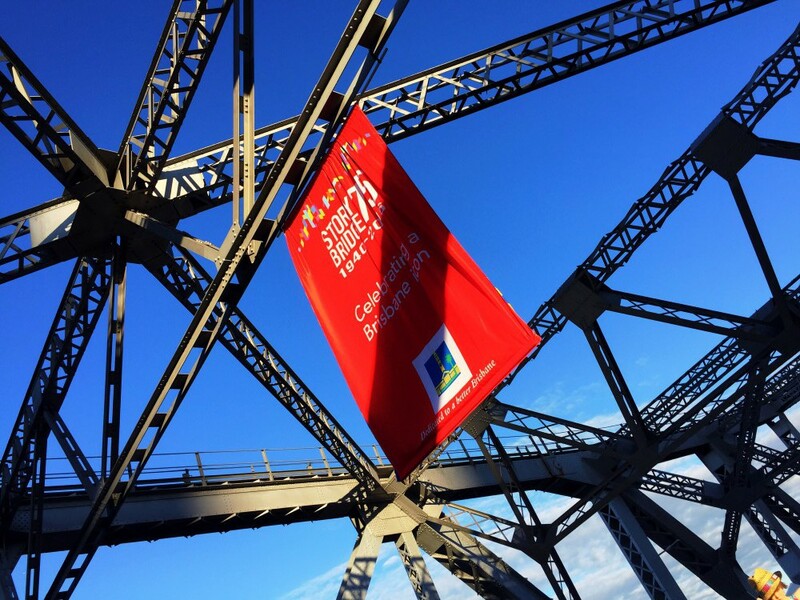 Yesterday marked the 75th birthday of Brisbane’s iconic Story Bridge and to celebrate, Brisbane City Council closed the bridge for most of the day for what was tipped to be one hell of a street party. Over seven hours, more than 70,000 locals hit the bridge to enjoy a kilometre long smorgasbord of food stalls, bars and entertainment, spread out over four 1.5-hour sessions with the first starting at 9am. But first, they had to make it onto the bridge. Tickets for the event were free, but due to health and safety issues, a limited number were released for each session and everyone from the last session needed to exit the bridge before the next session could enter. 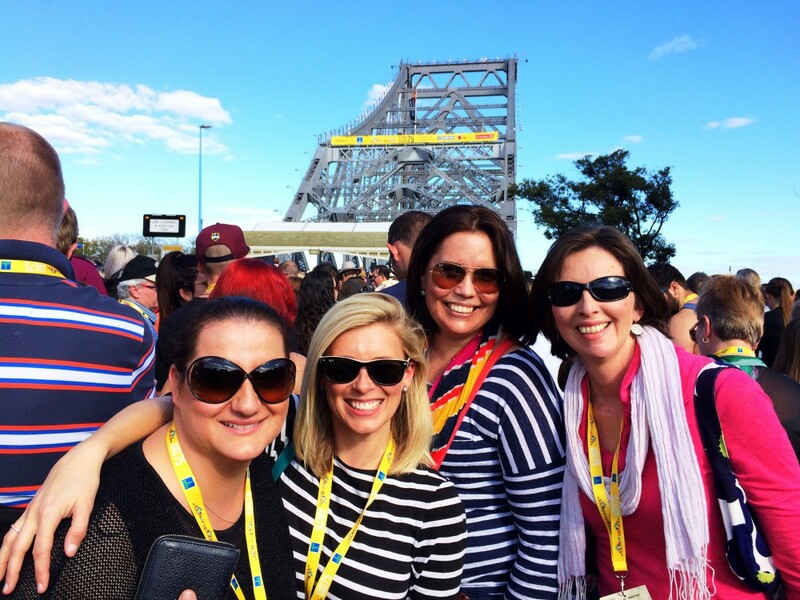 Elle, Nic, Jenny, Jane and I scored tickets to the day’s final session from 2.30pm to 4pm and spent 40 minutes chatting in the line waiting to be unleashed on the bridge. Thankfully Brisbane turned on a phenomenal winter’s day with blue skies, warm sunshine and a light breeze so standing around wasn’t too much of an issue, although some music wouldn’t have gone astray. We’d seen on social media that food lines in the previous sessions had been extremely long, with hundreds (or maybe it was thousands) of people giving up and heading to the coffee shops, pubs and cafes in the surrounding area. We figured if it was too crazy, we’d do the same. While plenty had less than pleasant things to say about the event on social media, I loved it. Yes, there were lines but if you apply for tickets to an event with 20,000 people attending at the same time, what do you expect? And when did we get so whingey? I’ve lined up for toilets at rugby games, for drinks at the pub on a Saturday night and even to get food on a standard Saturday night at Eat Street Markets. It happens. Besides, I didn’t wait more than 10 minutes to order food and that was only once, and there were some sections of the bridge near the stage that seemed a little more cramped and were foot traffic slowed, but that’s what street parties are like. As fas as the food went, the girls and I set out with a divide and conquer plan and managed to get our hands on plenty of options ranging from cannoli by former My Kitchen Rules siblings Jake and Elle and mouth-watering pork belly and deep fried zucchini fries from Poulet & Porc to a chocolate platter from New Farm Confectionary and honey puff sundaes with ice cream. And it was all delicious. It turns out that crumbed, deep-fried and topped with a dollop of aioli is my favourite way to eat zucchini! What I wore: Striped t-shirt: Saba | Distressed jeans: Witchery | Bag: Mimco | Sunglasses: Ray-Ban. Nic, Jen, Jane, me and Elle. Pork Belly with orange salad. Honey Puff sundae with nutella and caramel. First stop … meatball sub from Little Italy by Jake and Elle from My Kitchen Rules. And, of course, there was the added bonus of turning around in a crowd of 20,000 people and finding myself face-to-face with an ex-boyfriend. And his new wife. With the flick of a hand it was sunglasses on and head down as I raced off to get lost in the crowd. I guess it doesn’t matter how big or metropolitan Brisbane becomes, it will always retain just a little of that big country town feel. And I love that (even if it means running into people I’d rather not see!). Happy birthday to the Story Bridge! Absolutely right! 🙂 I took my 90yo mother (with a walker) and she loved it with no complaints. Found a spot, got some food, chilled out, listened to the band. The crepes were fabulous and so were the coffees.